Daniel Barash is one of 43 national Kennedy Center Workshop Leaders. He trains teachers how to use shadow puppetry with their students in workshops that are engaging, hands-on, and directly adaptable to the classroom. 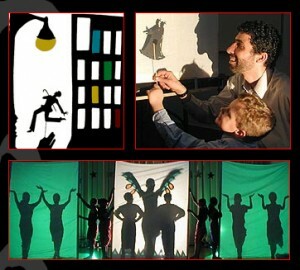 Shadow puppetry, with its bold shapes, vivid colors, and dramatic movement, is a highly engaging art form that allows students to express their understanding through visual art, drama, and writing. In this workshop, teachers discover how to create and use shadow puppets to explore story elements. Participants first learn shadow puppetry techniques and discover ways students can use shadow puppetry to explore character, setting, problem, resolution, story structure, and language. Participants then experience how students can create puppets and scenery to dramatically bring stories created through a “Story Challenge Game” to life behind the shadow screen.